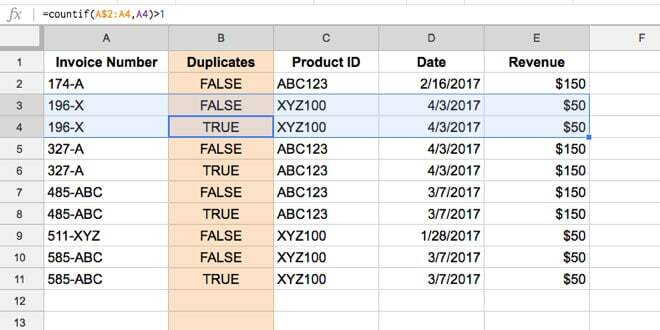 Duplicates (or duplicate entries, or duplicate rows) are instances of the same record appearing in your data more than once. They’re a huge problem and the bane of any data analyst’s life. It’s critical that they are found and removed before any data analysis is performed. Imagine you had two instances of the same client transaction for $5,000 in your database. When you summarize your data, you might think you have $10,000 in revenue from that client when in fact you only have $5,000. You’ll make decisions based on the wrong data. And we all know that’s bad for business. So it’s best that you deal with them head on. Thankfully, it’s not too painful or time consuming to fix them. 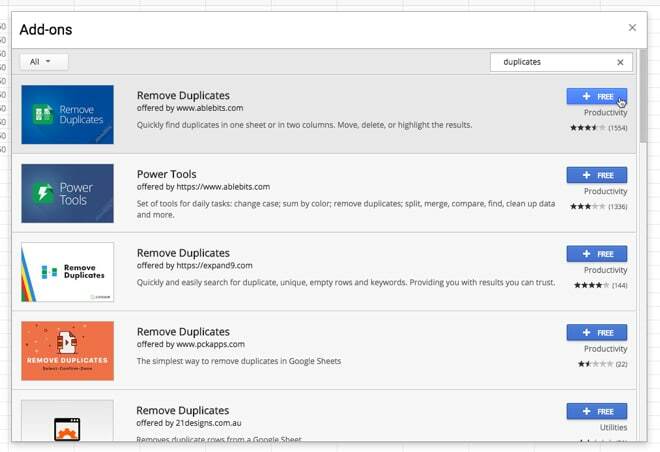 In this guide I’ll show you five different techniques on how to search for duplicates in Google Sheets and how to remove duplicates in Google Sheets. Method 1: Add-On is the most robust, practical method of removing duplicates at scale, but it involves using a paid third-party tool. Method 2: Formulas The UNIQUE formula is great for small, simple datasets or when you need to remove duplicates inside a nested formula. The IF formulas are a robust but rather old-school approach. They have the advantage of getting your hands dirty with the data so you really see the duplicate entries up close. 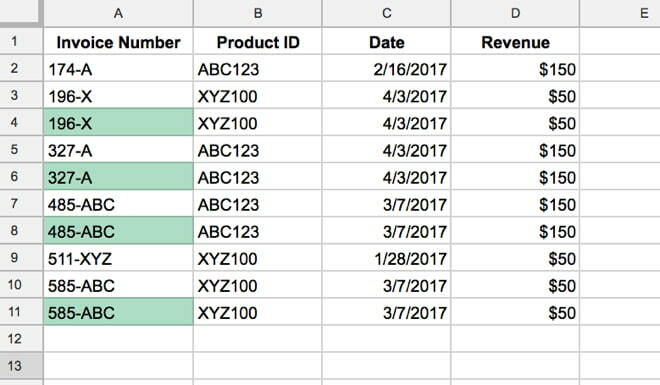 Method 3: Pivot Tables are a great way to search for duplicates in Google Sheets. 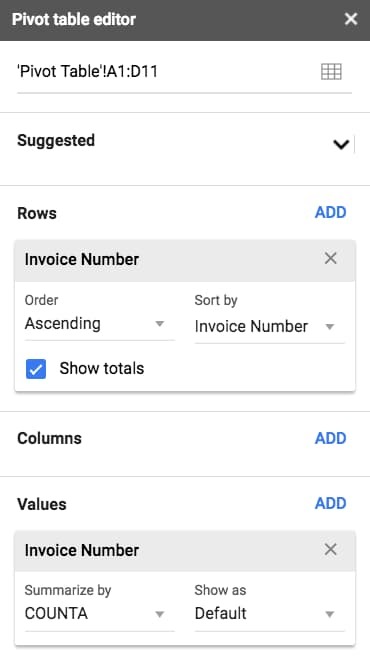 Pivot Tables are extremely flexible and fast to use, so it’s great tool to use when you’re unsure if you have duplicates and you’re checking your data. 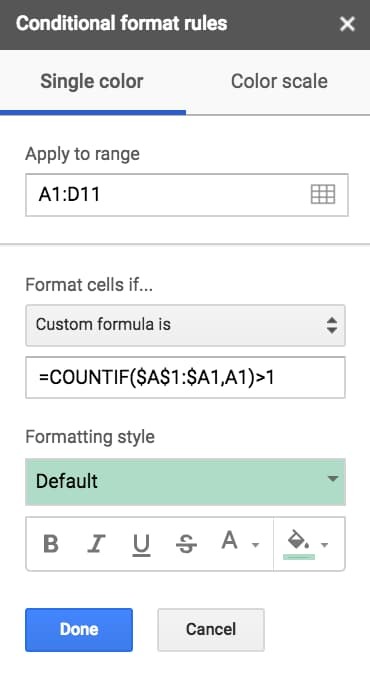 Method 4: Conditional Formatting is a great way to highlight duplicates in Google Sheets. Method 5: Apps Script is useful for developers who want to remove duplicates from Sheets as part of their apps, or someone who needs to repeatedly and automatically de-duplicate their data. In most cases, I would advocate using the Add-On, because it’s quicker and easier than the other methods. Having said that, I do use all of them myself, for the different scenarios described above. 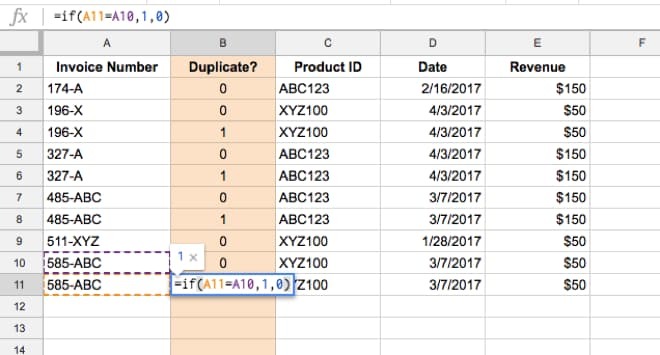 Learn more about duplicates and working with data in the Data Cleaning in Google Sheets course. Add-ons are specialized programs that you add to your Google Sheets, to give you extra functionality. They’re developed by third-party developers but are vetted by Google before they end up in the Add-On directory. This is a paid Add-On, although you can use the full functionality for free during a 30-day trial period. Click here to test out Remove Duplicates Add-On from the Add-On store. 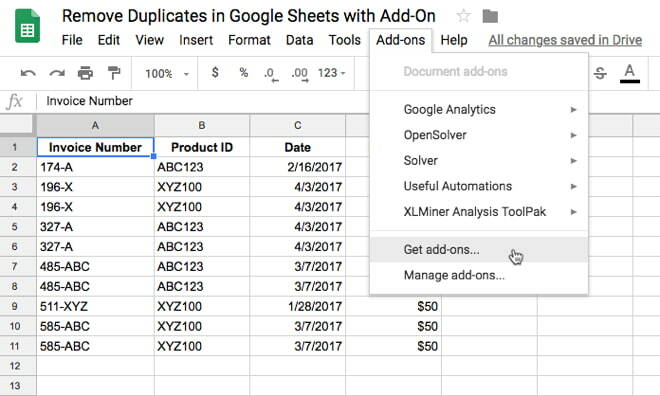 This add-on highlights duplicates in Google Sheets, deletes duplicates in Google Sheets and can even compare two columns for the same value. It’s very easy to use and super handy if you deal with duplicates a lot, or if you’re not sure where or why duplicates are in your data. Before you delete them, you can investigate which rows of data are duplicates and see if you can identify anything that’s a problem. It has a lot of options, such as whether you want to highlight duplicates, delete them, create a new copy of your data etc., so I’ll leave it to you to explore. This method deletes duplicates in the range of data you select. It considers all the columns of your data range when determining the duplicates. In other words, it compares each row of data and removes any rows that are duplicates (identical to any others across the whole row). It’s very easy to implement as it involves a single formula with a single argument — the range you want to de-duplicate (remove duplicates from). You can see the table on the right has fewer rows, because the duplicate rows have been removed. This method first highlights duplicates in your dataset. First, create a new column next to the data column you want to check for duplicates (e.g. invoice number). The $ sign is key here because it locks the range to the top of the column, even as you copy the formula down column B. So this formula checks for duplicates in the current row back up to the top. When a value shows up for the first time, the count will be 1, so the formula result will be false. But when the value shows up a second time, the count will be 2, so the formula result will be TRUE. The final step is to highlight the TRUE values (the duplicates) and delete them. Note: If you have a large dataset, with a lot of duplicates, then it’s best to turn the Duplicate column into values (Copy > Paste Special), sort by this column so all the duplicates (TRUEs) are in a block at the bottom of your dataset, and then delete them in one big group. It’s much quicker. This is how I first learnt to find duplicates and how to remove duplicates. It works by sorting your data and comparing adjacent rows. It’s rather cumbersome at first, because the formulas are a little tricky. However, it’s easy once you get used to it and has the benefit of getting you into the weeds of your data. You will see the duplicates up close and can investigate why they’re happening. It involves using an IF formula to check whether a value on your current row is equal to the value on the previous row. If they’re equal, then it’s a duplicate entry. Duplicate entries are assigned a value of 1, and unique (non-duplicate) entries are assigned a value of 0. That way you can easily count how many duplicates you have (by summing the column). 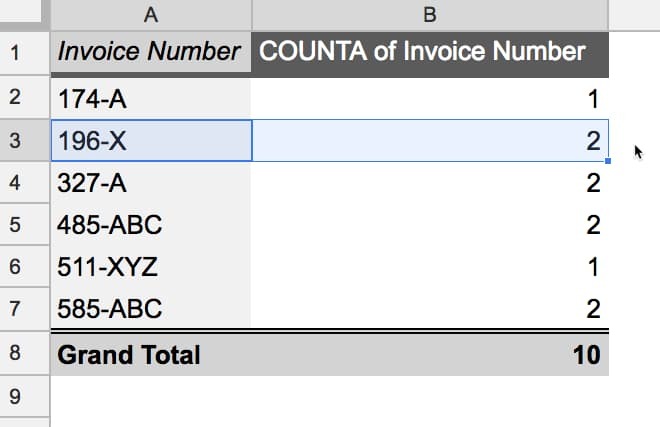 Only the first column, the invoice number, is considered for duplication purposes in this example. That means if two rows have the same invoice number then they’ll be tagged as duplicates, regardless of whether any other datapoints, like date, are different. You can see that invoice number “196-X” on row 4 has been marked with a 1 to indicate it’s a duplicate row. If you want to consider more columns or the whole row use one of other methods described in this article. This is done so that you can compare the unique entry and the duplicate entries side-by-side and investigate what’s happening before you blindly delete them. The final step is to then delete the duplicate rows. Do you have an invoice number you can check for duplicates? Or a transaction reference number? Or a student ID? Identify the column that should be unique. Then sort it from A-Z. This sorts all matching entries next to each other (so duplicate entries will be next to their unique counterparts). Apply a color coding to inform users that these columns have been added and were not part of the original dataset. This step is always worth doing. You may identify the source of your duplicate entries. Perhaps all the duplicates are specific to a certain date or customer, which you can then resolve. If you think you may want to use these formulas again, you can keep copies in the rows above your Sheet so you have them “live”. Highlight the data (consisting of 0’s and 1’s) in your two duplicate columns. Move all of the duplicates to the bottom of your dataset, so they can easily be removed as a single contiguous range. This is much faster than simply filtering on the duplicates and deleting them, especially if your dataset is large. Sort your data back to it’s original order, but now with the duplicate rows removed. This is the same as method 3 above, but applied to multiple columns. In this case, you want to search for duplicates in Google Sheets based on two (or more) columns. Maybe an invoice number and a product ID. First thing to do is to identify the columns you want to include in the duplicate consideration. This time, insert three new columns to the right of your final “unique” column. This new column consists of all of the “unique” columns squashed together. Now, use Method 3 to de-duplicate on this new “unique” column of joined values. You proceed through the same 10 steps from Method 3 to identify duplicates and duplicate groups. If you’re new to Pivot Tables, check out my article Pivot Tables 101: A Beginner’s Guide. Pivot Tables are extremely useful for exploratory data analysis. Pivot Tables are a great tool to use to search for duplicates in Google Sheets. They’re extremely flexible and fast to use, so they’re often a great place to start if you’re unsure whether you have any duplicates in your data. Highlight your dataset and create a Pivot Table (under the Data menu). A new tab opens with the Pivot Table editor. You can see that duplicates values (for example 196-X) will have a count greater than 1. From here you can lookup these duplicate values in your original dataset and decide how to proceed. As you can see, this method is most suitable when you’re checking for duplicates and want to go and investigate them. This method has two steps: 1) highlight duplicates in Google Sheets, and 2) remove those highlighted duplicates (optional). Select your dataset and open the conditional formatting sidebar (under the Format menu). 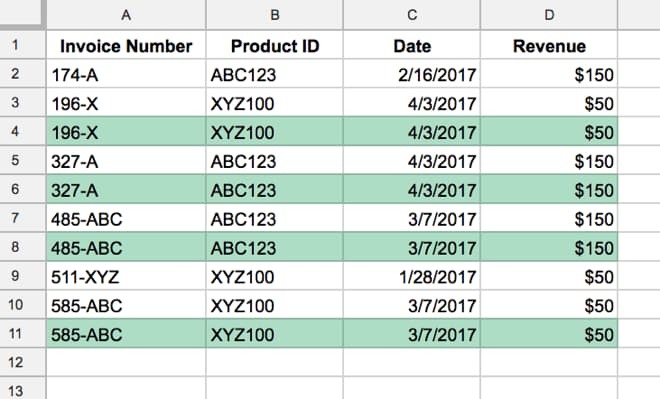 This formula checks for duplicates in column A. What if you want to apply the highlight to the whole row? Check out this article for a more detailed look at how to highlight a whole row using conditional formatting. It’s relatively straightforward to create a small script file that can remove duplicate rows from your datasets. The advantage of writing an Apps Script program is that you can run it over and over, for example each time you add new data. This program removes duplicates from a dataset in Sheet 1. It’s very specific to the Sheet and data range, but it’s easy to create and modify. The code for this simple duplicate program is also here on GitHub. The best thing about Apps Script is that it lets you build minimal viable products specific to your situation very quickly. Once you’re familiar with Apps Script, it only takes 15 – 30 minutes to build custom scripts, like this one to remove duplicates in Google Sheets. Now you know how to remove duplicates in Google Sheets with five different techniques, go forth and banish those duplicates from your datasets! Thanks for your info, super helpful! How to set up the app script?